What we do can be so much more important than what we say, because the things we do show our true intentions and feelings. The car with a religious bumper sticker just cut me off. A parent makes rules and then routinely breaks them. A leader just asked everyone to scale back and then spends like there’s no tomorrow. A politician says, “Trust me,” but we quickly learn that his promises are empty. The truth is, talk is cheap. 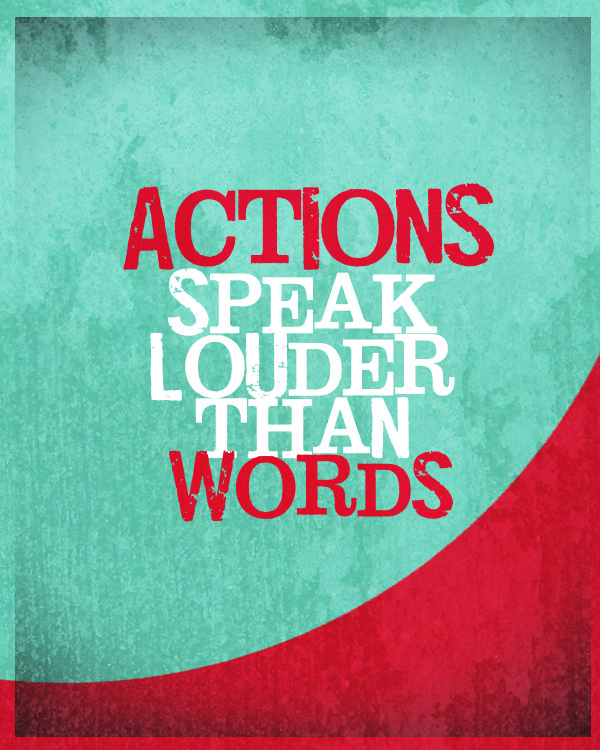 Actions really do speak louder than words. Why do people make promises one second only to break them minutes later? Why do people say they care when it’s so obvious they couldn’t care less? Some people may say it’s not a big deal; everyone does it; no one’s watching anyway; people don’t really care. Well, I’m here to tell you they’re sadly mistaken! Let’s face it, you send a message with what you say AND what you do. If words aren’t supported with consistent actions, they will ring hollow. The bottom line is simply this: Any time you make a claim, no matter how small, and display inconsistent behavior, you weaken your bond of trust with others. As a result, anything thought to be predictable in the future may be treated as suspect. The fact is, everything you do in life sends a message. So, make sure to practice what you preach. So what does all this mean to us who love to obey and apply the Words of Truth from our Bibles? I have to admit first of all that I miserably fall short when it comes to expressing the love that that God desires me to both have and give unto to others. These words were written 2,000 years ago and yet they are all so relevant today. It seems that the human nature still with us desires not only to love itself more than others, but it schemes to bring out, at most inopportune times the evil wickedness in our hearts. If only we could see the truth in this, that every word we speak, followed by an affirming action can have a huge impact on people, circumstances, and our environment around us. Look at what example we are given with what and where words are crafted. As I read throughout the Gospels, Jesus gave us so many examples, that show us how to follow a word of love with an action of truth. The night of the Last Supper, Jesus spoke of the extent where He was going of His love, and yet when finished, the Bible say’s that He rose from the table, and girded Himself with a towel and filled a basin with water and proceeded to wash the feet of His disciples. When completed He said to them, “I have set an example before you, that you are to do to each other what I have done for you; now that you know these things, go out and do them.” An act of love followed by an action. For us today, this could be expressed in maybe if you have told someone who you are praying for them, follow it up with an action, maybe a card, or flowers. Allow the Holy Spirit to bring together the love and the action. I can tell you how much of an impact it has been for me, so many saints praying for me; it is overwhelming grace in its purest form! But there have been many who followed up that love with action! They brought meals, came by to visit, played instruments! So many ways we can let people see that our love for others becomes something we anticipate as we are led by the Holy Spirit in following up with action. Words certainly have the capacity to harm or elevate, and they may sometimes speak louder than actions are speaking louder than words. Maybe God has put someone on your heart today that needs to see action, a manifestation of this kind of love in words right in front of them. Or maybe you’re looking for an opportunity to take action, and love upon the brethren. There are just so many ways and opportunities to do this. Make a call, make a visit, make Jesus real and alive as you take this step of faith. Jesus was a Man of love and action, and He has called us all to “follow Him”. Let’s show our love for our family, that what we do is more important than what we say, because the things we do show our true intentions and feelings: by the way we live and what we do for each other. I like this little saying. Praying 4 u & yr wife.